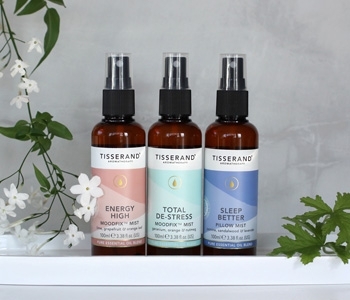 Take a moment to recentre your mind and body with the Tisserand Mist collection, an aromatheraputic range that provides instant wellbeing. Created to revive, refresh and rebalance you, each Tisserand mist will surround you in a powerful blend of essential oils that can be sprayed into the air, onto your skin, or onto fabric. Choose from the stimulating citrus tones of the Energy Mist, the relaxing tones of the Sweet Dreams Mist, or the aromatic boost of the De-Stress Mist for complete calm, no matter where you are.